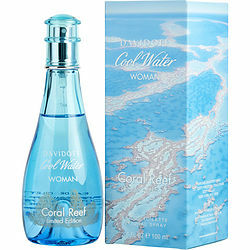 Introduced in 2014, the Cool Water Coral Reef collection offers unique and refreshing fragrance options for men and women. True to the Davidoff line's reputation for intriguing combinations and themes, Cool Water fragrances feature notes such as melon, lily-of-the-valley and orris to create a scent that is crisp, clean and fresh. These fragrances are ideal for wearing whenever you want to bring a bit of tropical fun and relaxation with you to school or work.